For added durability and to ensure your garden parasol remains secure for the duration of the summer, then these garden parasol bases are a must. The unassuming flat design of our garden parasol stands enable for it to effortlessly fit underneath your garden table. 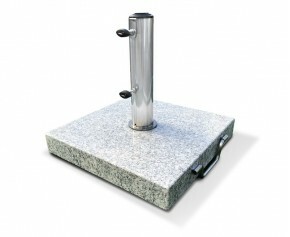 This patio umbrella stand is suitable for parasols with diameters of 38mm and 48mm. Our stylish, heavy duty (25kg) and weather-resistant granite parasol base with wheels is made from a robust combination of granite and stainless steel. It is suitable for use with parasols with a shaft diameter of 35mm - 52mm and includes the relevant adaptors and tightening knobs to keep the parasol secure. 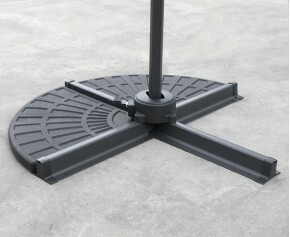 Prevent your parasol from blowing away with this grey heavy-duty parasol base. Featuring a steel base and pole, powder-coated in a smooth grey finish to retard rusting and for aesthetic appeal, this heavy-duty garden parasol stand is suitable for all garden sizes and styles and can be placed unobtrusively under a table setting. 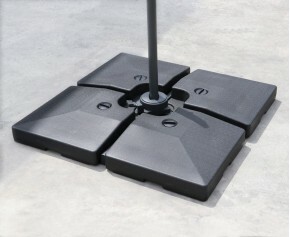 Prevent your parasol from blowing away with this slate grey large 20kg steel parasol base. Featuring a powder-coated steel base to retard rusting and an attractive stainless steel tube for aesthetic appeal, this garden parasol stand is suitable for all garden sizes and styles and can be placed unobtrusively under a table setting. This HDPE concrete filled cantilever parasol base will keep your cantilever parasol from falling over or blowing away so you'll always be sheltered from the harsh sunlight. This cantilever parasol base will keep your cantilever parasol from falling over or blowing away so you'll always be protected from the sun. 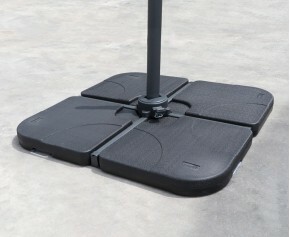 These HDPE concrete filled cantilever parasol base slabs will keep your cantilever parasol safe and secure. Simply place each slab around your cantilever parasol's cross stand to keep your parasol secure. Purchase 2 sets for maximum stability. 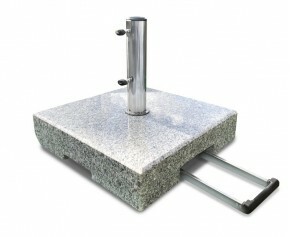 Keep your cantilever parasol safe and secure with these fillable cantilever parasol base weights. We have a range of parasols and stands online - shop now.